Barely Lethal is a record-scratch comedy, one of those movies built on ironies so thin that the sound of a record scratching is there in spirit, if not in actuality. (The purest example of a record-scratch comedy: 1992’s Frozen Assets, in which Corbin Bernsen learns that he’s inherited a bank, only to discover—screeeeeeech—that it’s a sperm bank.) In Barely Lethal, Hailee Steinfeld plays a deadly teenage secret agent who fakes her own death in order to live like a normal adolescent, only to discover—screeeeeeech—that high school is more treacherous than fighting terrorists. And that all her specialized knowledge and skill—screeeeeeech—is more liability than asset on this particular secret mission. And that those vintage teen comedies she watched to study up, like Clueless and Mean Girls, for high school life today... well, actually, those more or less apply. Because while Barely Lethal is conscious of the clichés of the genre, it’s also the type of film that won’t let that get in the way of regurgitating them. The film has a buoyancy to it, though, that’s a credit to Steinfeld’s enthusiastic turn as “Megan Walsh,” a Canadian exchange student with a mysterious past. 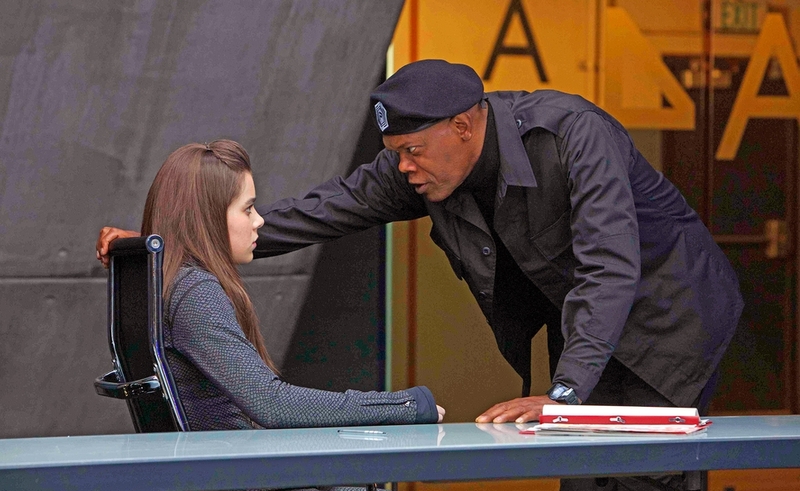 Prior to arriving in American high school, Megan was part of the “Prescott” program, an initiative led by Agent Hardman (Samuel L. Jackson) to train orphan girls from a young age to be detached, remorseless spies for the state—under the reasonable logic that the enemy would not expect it. While on a mission to bring down Victoria Knox (Jessica Alba), a former Prescott girl turned international terrorist, Megan goes off the grid and uses the opportunity to reinvent herself as the normal high-school kid she always wanted to be. Her host family includes a moody, suspicious girl her age (Dove Cameron), and though she has trouble making friends at school, she draws the attention of a nerdy A.V. geek (Thomas Mann, the “me” of Me And Earl And The Dying Girl) and a super-cool band frontman (Toby Sebastian). Will the cool kid turn out to be kind of a narcissistic douche? Maybe the sweet, sensitive, pun-loving A.V. geek is the guy for her? Megan’s research should answer those questions for her. Barely Lethal is directed by Kyle Newman, of Fanboys fame, and it has a similar low-level movie-nerd quality, using references to extremely popular films in order to make ancient story beats seem fresh and knowing. Given that Megan relies exclusively on teen comedies for anthropological research, it’s a failure of imagination of Newman and screenwriter John D’Arco’s part that the high school in Barely Lethal resembles movie high schools at least as much as it defies her expectations. Beyond that, the film makes her seem stupid when it means to make her comically naive: Megan’s total lack of exposure to normal teenage life makes her a fish out of water, but asking her host mother about “transpo at oh-seven-hundred” (i.e. the school bus) is a little much. When Megan’s Prescott handlers finally turn up to wreak havoc, chiefly in the form of a rival agent played by Sophie Turner (Sansa from Game Of Thrones), Newman handles the spy games perfunctorily, because it’s less important than her adjustment among average kids. But there’s no telling where the fantasy of teen espionage and the fantasy of Mean Girls high school ends and some plausible simulation of real teenage life begins. It’s all a movie for Newman. And mostly a bad one.